Six of the accused-defendants involved in the occupation were sentenced to 1 year and 9 months imprisonment, plus fines of € 2800 each. 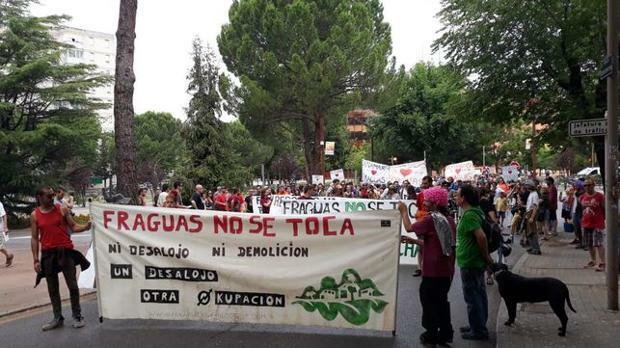 In addition, the demolition of the town of Fraguas is demanded, with the costs of demolition, still without a fixed value, being imputed to the defendants. If the payment is not made, the imprisonment will increase to 2 years and 3 months of jail. The Fraguas occupation began in 2013. Then, an abandoned village – like so many others in spain -, it became a rich experience in autonomous, communal life. And as with urban occupations, it is this which the State and capital cannot tolerate. We share below a statement of solidarity by chimera (14/02/2019) and a short video documentary. What crimes do those who revive Fraguas commit? It is not a crime to care for and cultivate the earth. It is not a crime to plant trees. It is not a crime to plant water. It is not a crime to take care of people. It is not a crime to share. It is not a crime to liberate relationships. It is not a crime to restore memories and the knowledge of a people and a place. It is not a crime to handle soil and nature with respect. It is not a crime to re-appropriate constructed spaces. It is not a crime to use tools and technologies for creating free lives. It is not a crime to care for culture and education. It is not a crime to take care of health and physical-psychic-spiritual well-being. It is not a crime to care for just, honest, and liberating economies. It is not a crime to share Earth. So what crimes do they commit? It is not a crime to sow and reap healthy food. It is life to gather people and affections, solidarity and mutual help. Creating life is not a crime. Freedom will never be a crime. Capital and the State and their anti-ethics, applied through the judicial apparatus, judges it a crime and finds it reasonable to imprison human beings who wish to live a life free from the standards imposed by capitalism. What can the powerful do against us who love free lives? Nothing. Even when they think they have stopped us, they will not have stopped us. We will continue to sow, in the Fraguas of the many worlds we are building. Nothing, never again, will it be able to stop the growth of the seeds of worlds planted by / in Fraguas. Fraguas warms and now inhabits our hearts, represents a new world of freedom, autonomy, new practices, without the determinations of the leviathan, far from the logic of power. Fraguas shows us that a life of freedom is possible, in the fields, in the towns and villages, in the occupations, in the cracks of the system, between the lines, in a land without evils. Fraguas inhabits us. We inhabit Fraguas. This entry was posted in Commentary, News blog and tagged Fraguas, Land Okupations, revolution, spain. Bookmark the permalink.